I think you are correct the biggest problem is that it would take every country in the world to purchase the same boat. I agree this would be great for the sport but it is really not feasible at this time. There are all kinds of things that would have to be solved and one of the biggest is getting everyone to agree on the same boat. Just go check out the threads in the ABC section under towboats. There are as many opinions about boats as there are people in the world. I would love to just have an old Flightcraft, not gonna happen, the wife does not want an outboard because she wants the platform across the back and the prop under the boat. It is safer for the kids. This is a great thread and has gotten the thoughts moving. i didn't hear mention of the Sanger Outboard...its better than a flighty and Sanger might really build it again if you asked...but i like a platform and an inboard too so the DXII from Sanger gets my vote for the world barefoot boat as long as they go small block high horsepower...i am currently the owner of the dream barefoot boat, a Sanger DXII with a Mercury Racing Scorpion 377 ci/hp 400lbs torque 50+mph tournament loaded and towing a footer...it does it all. I agree with BFTSKIR we already have a boat and a company who wants to make the barefoot program work... SANGER! Call Scott Peletan and if you have a way he can sell more boats andf make more money he will be all in. He has tried to keep the barefoot boat at sanger alive for years despite sangers lack of interest. If it werent for Scott the DXII would be history too. There is no market, and going to one specific hull will alienate skiers even more, if they cant have a current or past boat to train on they will leave the sport too. I havent seen any posts from BFC01 on this but Im sure he has alot of input. Unless we get barefooting as big as wakeboarding we are not gonna get a bearfoot specific boat, we will get a boat made for something else that may be good for barefooting. 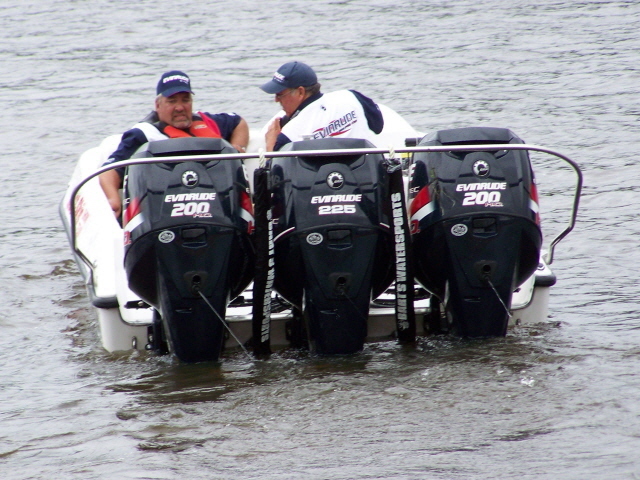 In my humble opinion trying to monopolize the tournament boats is not the answer. Why are we worried about this anyway? BAREFOOT ON WHAT YOU GOT< JUST BAREFOOT!!!! AND TEACH SOMEONE NEW TO BAREFOOT!! !